She was a woman born into wealth and prestige. She bore a family name of tremendous local power. She had the benefit of a very fine education. An encounter with the pope at age 29 changed her life forever. It gave her the courage to divest herself of the family fortune into which she had been born. She began a new life as a religious sister, founding missions and schools to serve African & Native Americans. She lived for years in what is now the hospital I visit every week, and she now is buried three miles from the rectory in which I live. 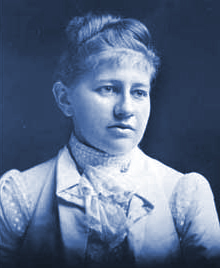 Saint Katharine Drexel was a liberated woman before the term “women’s liberation” was coined. She was truly liberated—free to love God and neighbor, without fear. The movement of women’s so-called “liberation,” on the other hand, seeks freedom in very misguided ways. It defines liberation in terms of voting rights, equal education, and opportunities to pursue professional careers. These are all good things, in themselves, but none of them is the secret to true freedom. Mother Katharine always looked up to the Blessed Mother, who is the only truly liberated woman (or man, for that matter) in human history. Taking Mary as her model taught Mother Katharine that authentic liberation is found only in one place. It is not in the voting booth. It will never be found in contraceptives. Nor is it sitting behind an executive desk. The only source of true liberation for all people (men & women) is the only thing that will ultimately matter. It was the center of Mother Katharine’s life: the Most Blessed Sacrament. May the Heart of Jesus, in the Most Blessed Sacrament, be praised, adored, and loved with grateful affection at every moment, in all the tabernacles of the world! Amen.